Although the signs are replaceable, it is not cheap. “To do all three of our runways and of course the short runway doesn’t have as many signs as the longest one does, it would cost about $40,000 to retrofit that,” says Schalliol. Although experts say they might have to be replaced. “I would say it absolutely will continue, because it arises from a liquid core in the earth and that core is not going to solidify anytime soon. 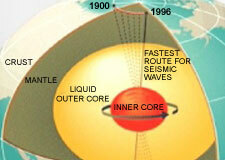 So we can expect the magnetic field to continue to be present and to continue to move,” says Peter Burns. According to the Airport Director, the retrofitting will not begin in South Bend any time soon. Although he estimates any change will likely be at least three to four years down the roads. If the movement of the magnetic North Pole continues at its current rate, it will move from its current location in Northern Canada to Siberia in 50 years. Thanks a bunch for finding the time to describe the terminlogy for the noobs!